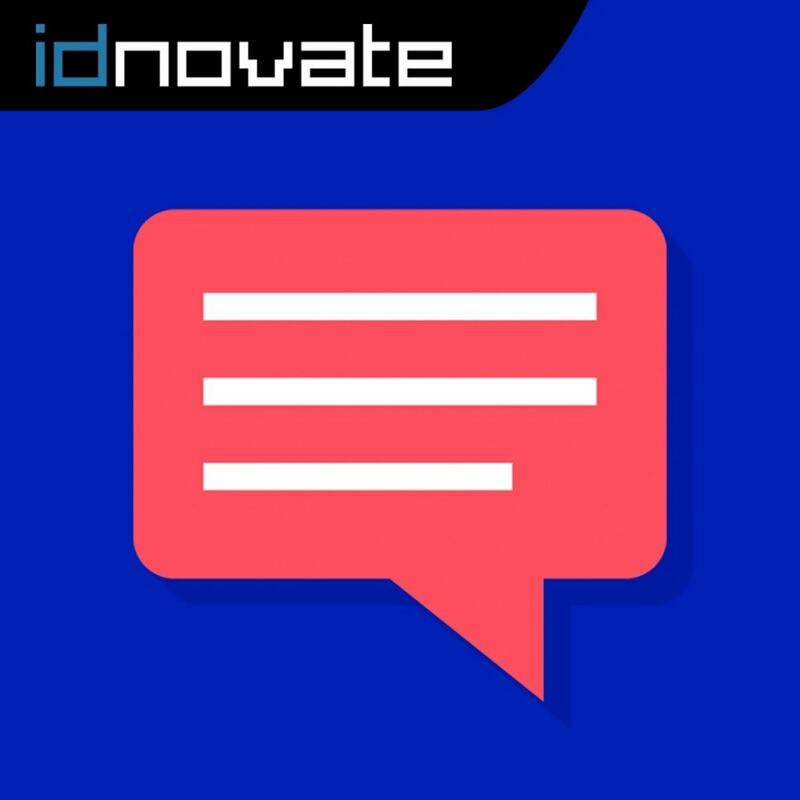 This module is a great tool for announcing new products, discounts, warnings and even for retaining your clients. It offers you the perfect opportunity for notify your clients of significant events through a popup. When the user accesses the page. When your client clicks onto the page the popup will be shown. When the client adds a product to the cart. 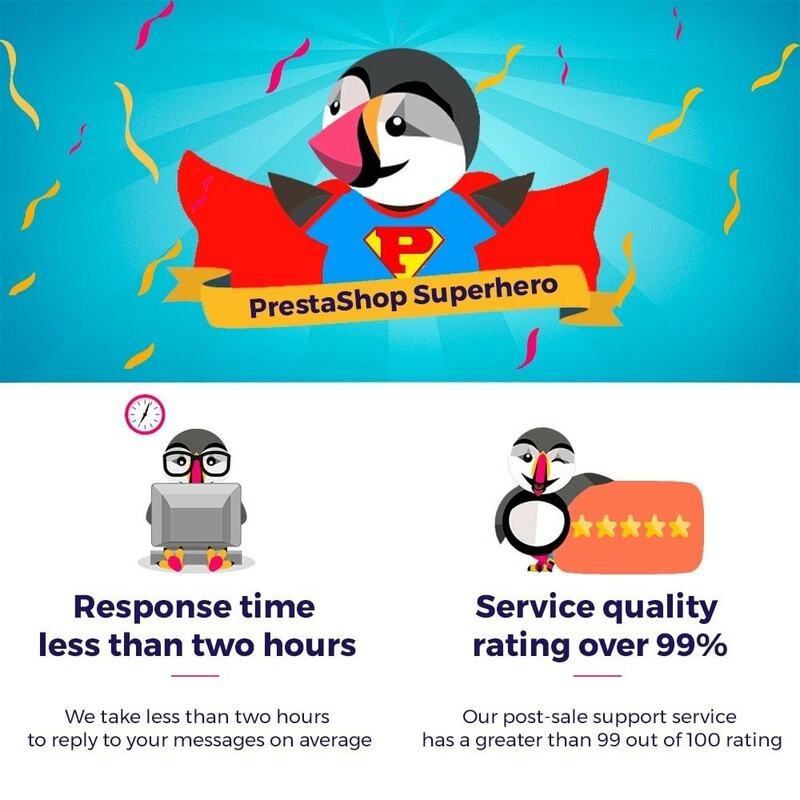 Show your client, for example, the offers in your shop or that the shipping costs are free from a certain amount, for example. In this way, you can increase the average amount in each cart. When the client tries to leave the shop (exit popup). Why not try and hang onto them with a discount code? When the client clicks on any element. 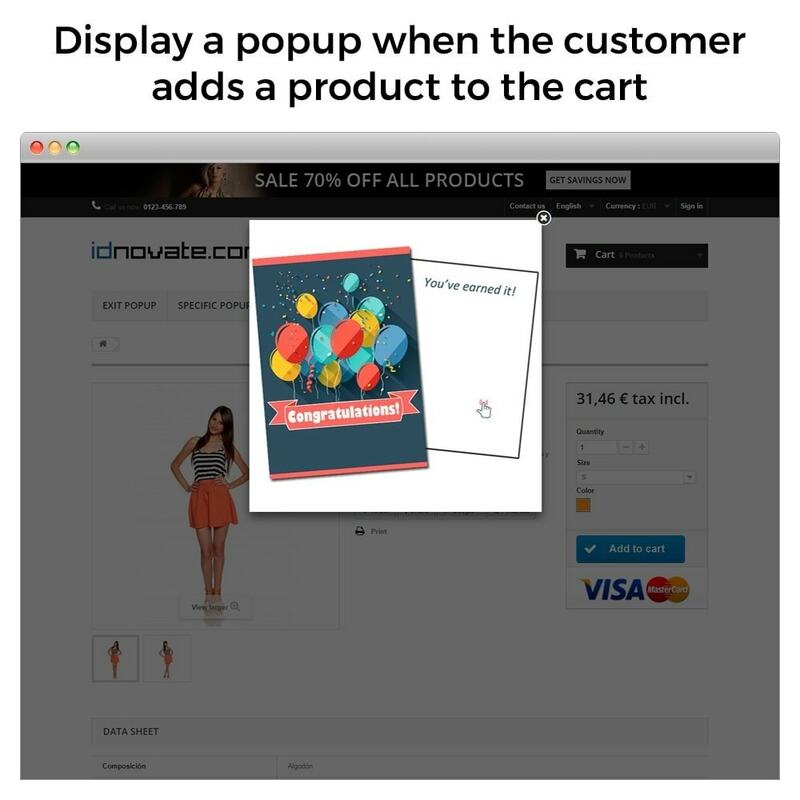 Display a popup with additional information when customer click on any element: a title, a word, an image, etc. HTML Code. You can insert HTML content from other platforms like newsletter services (Mailchimp, Acumbamail, Sendinblue), surveys, etc. The popup can be shown on any page. 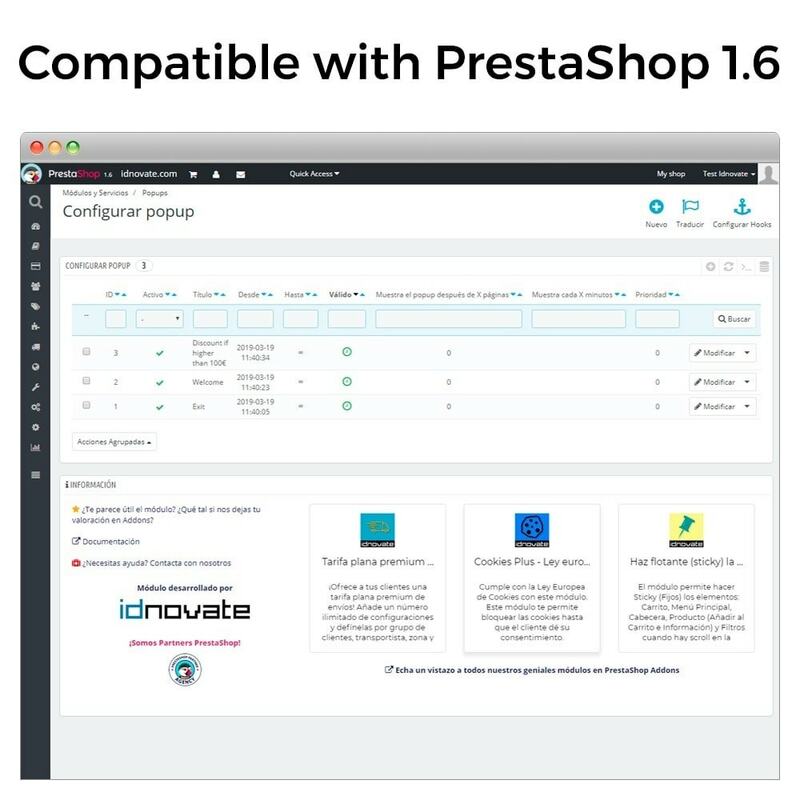 You can configure in which categories/products/manufacturers/suppliers and for which group of clients/clients/countries/area/language the popup is shown. For example, you can show the popup only for certain selected products and only for a group of clients, or announce a sale in a category for a certain country. Studies have shown that popups are 13 times more effective in the click generation and in the gaining of subscribers. Therefore, adding them to your shop is a fantastic way of increasing followers, obtaining more subscribers or commercializing a product or service. 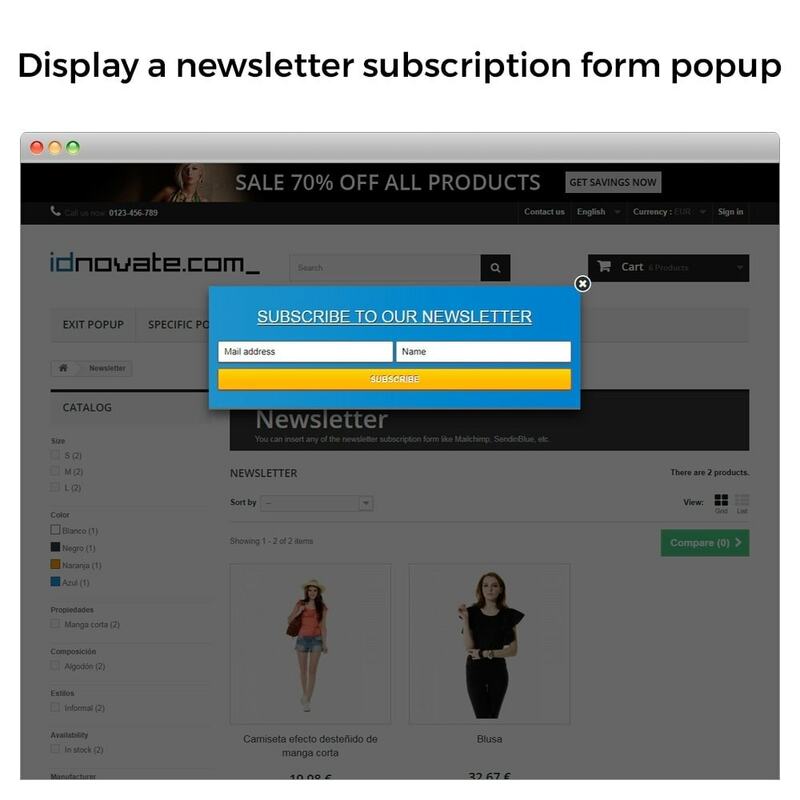 The module allows you to add any subscription form of the newsletter platforms, so you will only have to generate the form on the other platform and copy it into the popup content. 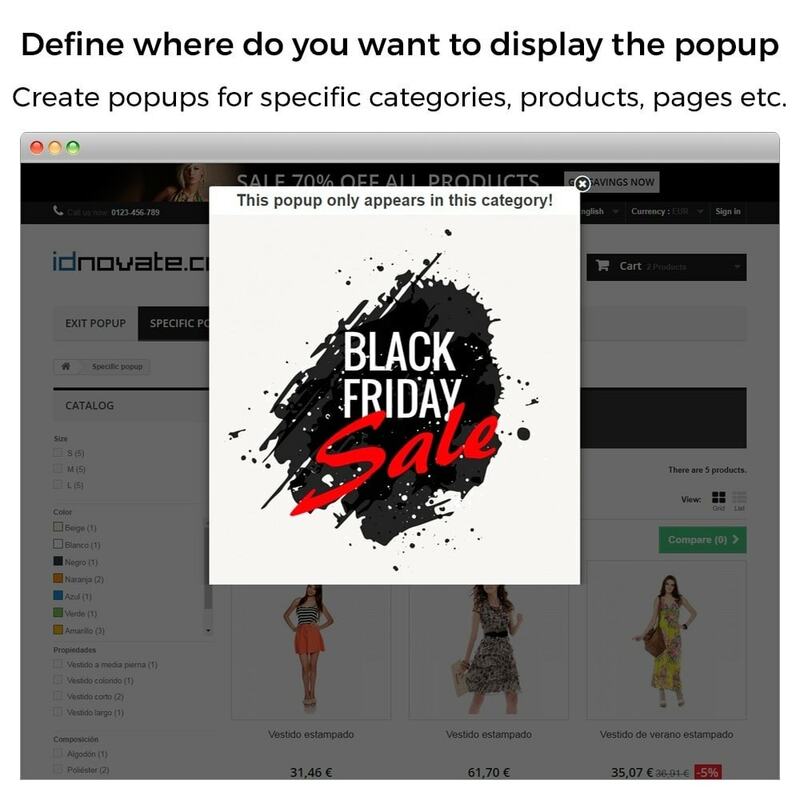 An obvious advantage of popups is their visibility This is the first thing the visitors see when they access your store. They catch people’s attention immediately and give you the opportunity to offer information clearly. Furthermore, the module permits the adding of timers to show it after a few seconds have passed, and also close it automatically after a set number of seconds. 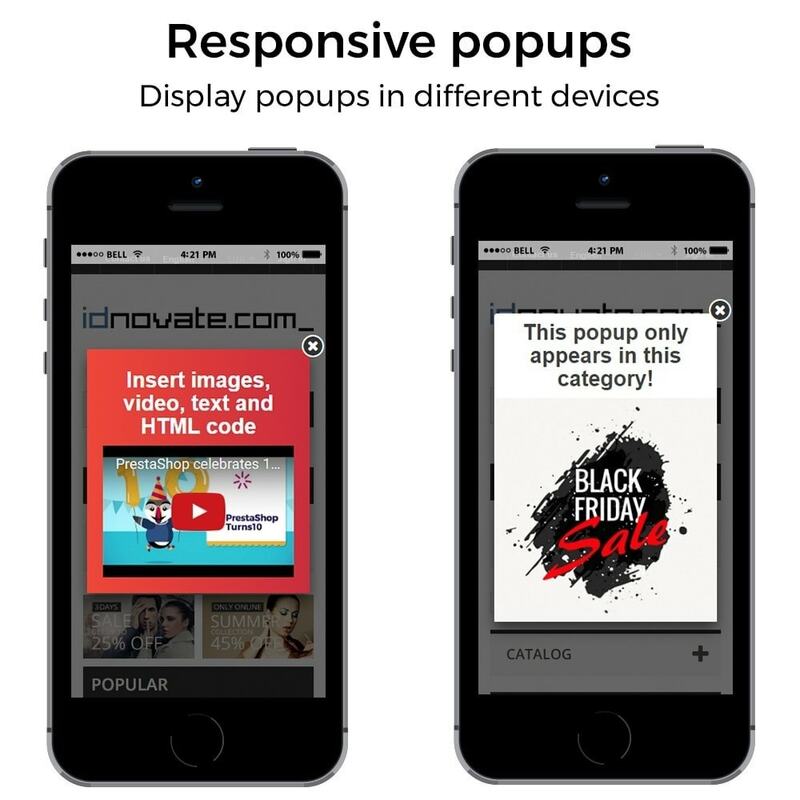 You can establish different content and configuration for every popup. 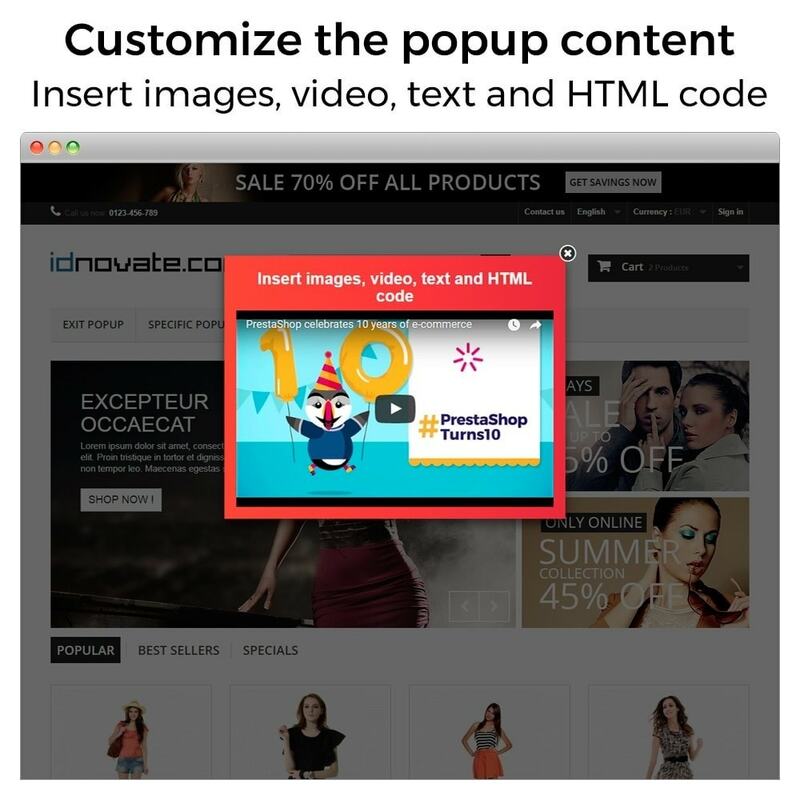 The appearance of the popup can be personalised, at the level of content as well as design. Furthermore, thanks to the WYSIWYG field it will be very simple to edit the content. Show a different text or image according to the language in which the client connects to the store. The module allows you to establish a different image for each one of the languages your store is in. You can choose between what dates you want to show to popup and configure the frequency (the time before it is shown again: every hour, every day, just once, etc.). You can also configure the popup to close automatically after a few seconds. You can combine these filters so that you can configure a popup for a group of clients for a specific product, and another different popup for another group of clients in a certain category, for example. You can create one popup that is shown on all PC, tablet and mobile devices, or create a popup for each one of the devices depending on their resolution. In this way, you can show popups only on the PC or on mobiles, or show a different window depending on the device. You can configure a priority for each popup. 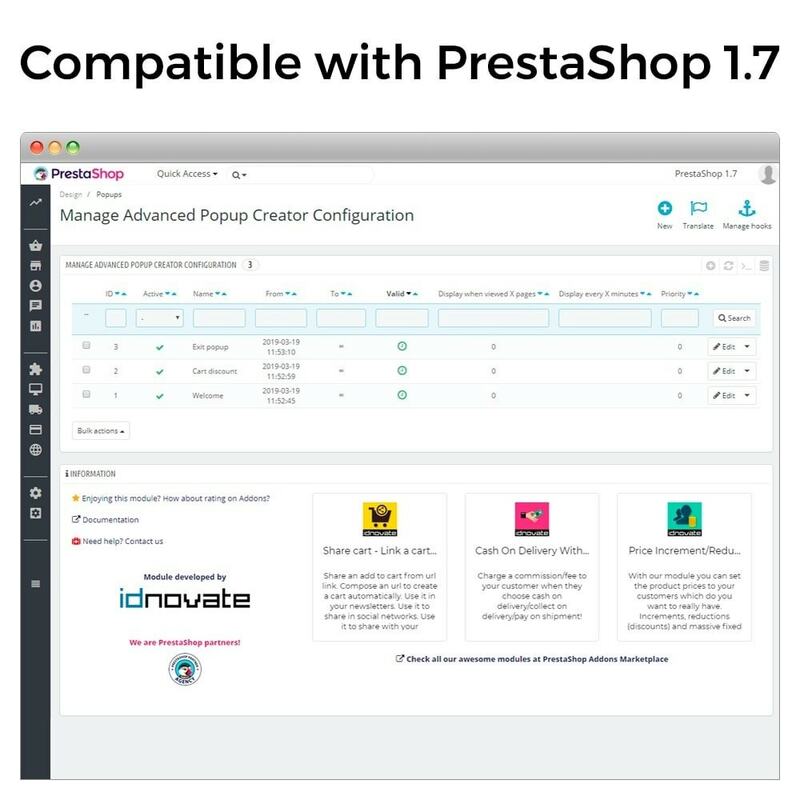 For example, you can configure a popup for the products in one category and another popup for a specific product in that category, or a popup for the whole shop and another specific one for one group of clients. 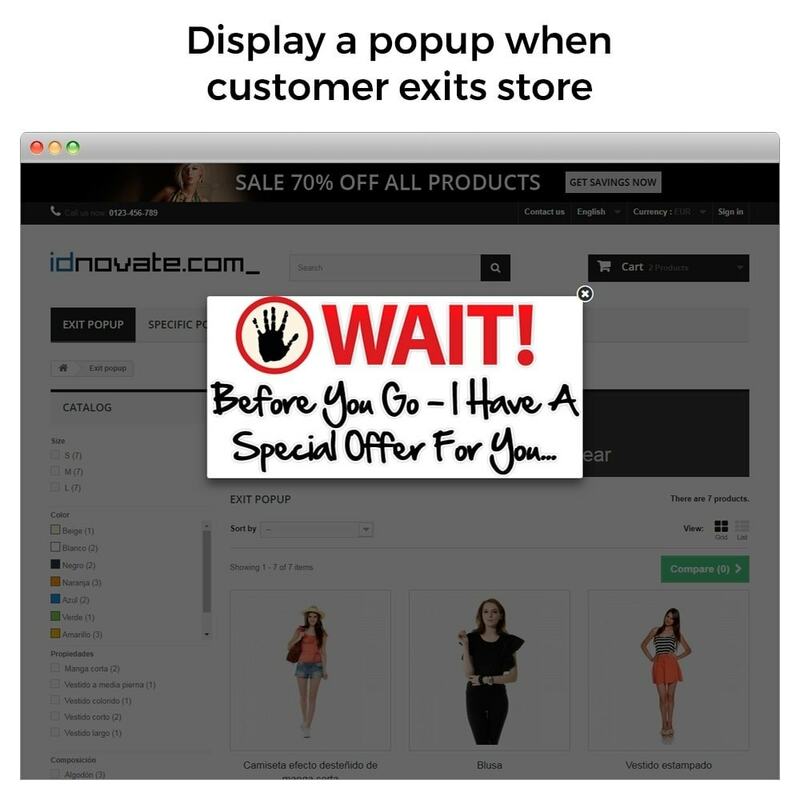 You can select different effects to open and close the popup to get customer's attention. 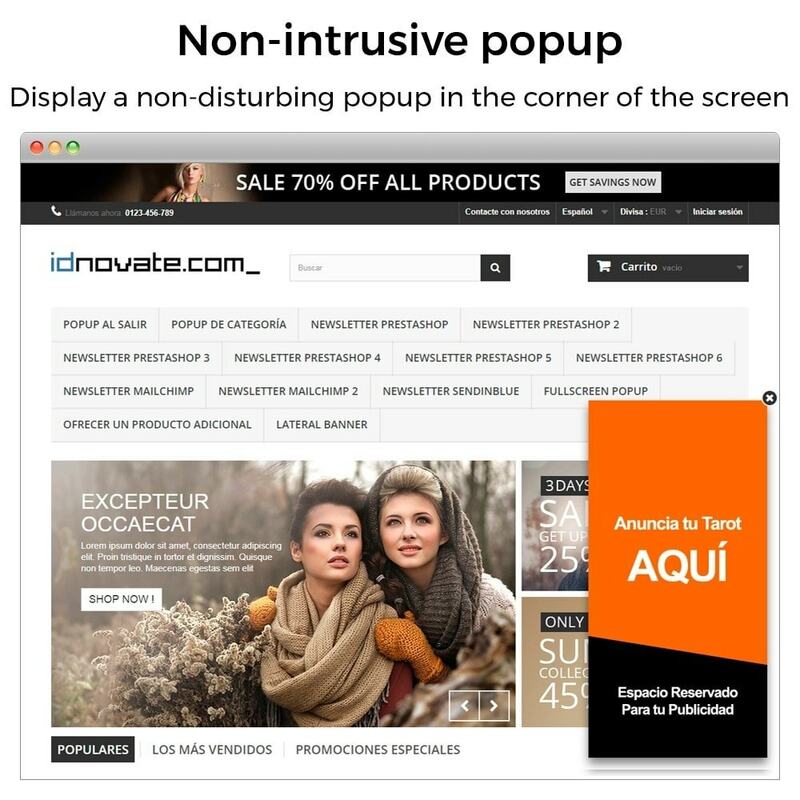 Configure discreet and non-intrusive popups that appear on the side and do not disturb normal customer navigation through your store. You can place the popup in any position of the window: in the corner, in the center, on the side, etc. 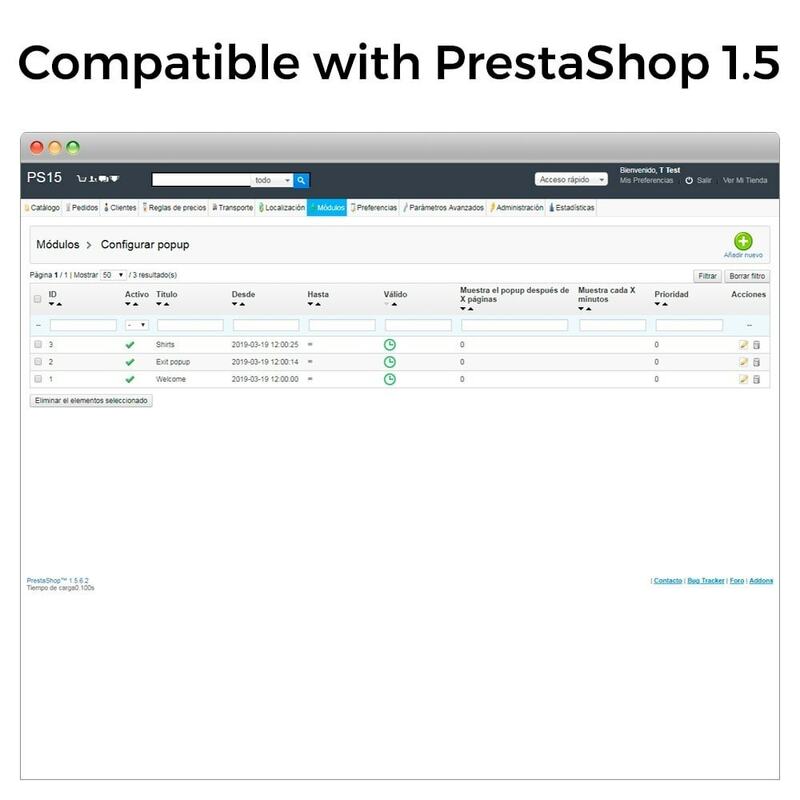 We frequently addupdates to the module, to incorporate new functions and to adapt it to the latest versions of PrestaShop.